"The Locomotion" redirects here. For other uses, see Locomotion. (1962) "Keep Your Hands Off My Baby"
"The Loco-Motion" is a 1962 pop song written by American songwriters Gerry Goffin and Carole King. "The Loco-Motion" was originally written for Dee Dee Sharp, but Sharp turned the song down. The song is notable for appearing in the American Top 5 three times, each time in a different decade: in 1962 by the American pop singer Little Eva (U.S. No. 1); in 1974 by the American band Grand Funk Railroad (U.S. No. 1); and finally in 1988 by the Australian singer Kylie Minogue (U.S. No. 3). "The Loco-Motion" was also the second song to reach No. 1 by two different musical acts in America. The earlier song to do this was "Go Away Little Girl", also written by Goffin and King. It is one of only nine songs to achieve this feat. King and Goffin wrote "The Loco-Motion" in hopes to have it recorded by Dee Dee Sharp, who had a smash hit with "Mashed Potato Time". Sharp passed on the song leaving the opportunity open for Eva Boyd, who had recorded the demo. Boyd's version was released, and her name was changed to Little Eva. Boyd was actually Carole King's babysitter, having been introduced to King and King's husband Gerry Goffin by The Cookies, a local girl group who would also record for the songwriters. "The Loco-Motion" was the first release by the new Dimension Records company, whose releases were mostly penned and produced by Goffin and King. There are two common versions of the song in circulation: one includes handclaps during the verses; the other has no handclaps. King performed the backup vocals in the recording. In the United States, "The Loco-Motion" was the sixth most successful single of 1962, according to Billboard. It was also the third most successful single of 1962 in South Africa. In March 1965, Little Eva sang the song on the ABC-TV series Shindig!, and this is the only known video of her singing this song. A cover version of the song was recorded quickly by British girl group The Vernons Girls and scored the chart the same week as the Little Eva version. The Vernons Girls' version stalled at No. 47 in the UK, while the Little Eva version reached No. 2 on the UK charts. It re-entered the chart some 10 years later and almost became a top 10 again, peaking at No. 11. The Little Eva version of the song was later featured in the David Lynch film Inland Empire (2006). "The Loco-Motion" is ranked No. 359 on Rolling Stone magazine's list of "The 500 Greatest Songs of All Time". 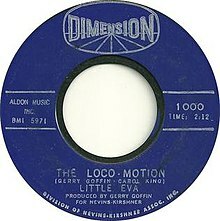 The widely believed story of how the song "The Loco-Motion" came to be is that Carole King was playing music at home and Eva Boyd was doing some chores and started dancing to it; the dance The Loco-Motion was born. However, this is not true. Eva Boyd was introduced to Goffin and King and they realized she had a good singing voice, so they had her record "The Loco-Motion". Carole King stated this during an interview on National Public Radio (NPR) shortly after Little Eva died. As the song came before the dance, there was no dance when the song was originally written. When the song became a smash hit, Eva Boyd ended up having to create a dance to go along with the song. Carole King stated this in her "One to One" concert video. In live performances of the song, Little Eva can be seen doing her version of the dance. Another bit of the conventional lore is that she had received only $50 for "The Loco-Motion". However, although she never owned the rights to her recordings, it seems $50 was actually her weekly salary during the years she was making records (an increase of $15 from what Goffin and King had been paying her as nanny). In 1971, she moved to South Carolina and lived in obscurity on menial jobs and welfare until being rediscovered in 1987. She died of cervical cancer in 2003. Top-40 DJ Dan Ingram has been quoted as saying that he believes the original "The Loco-Motion" was recorded by Carole King herself. Producer Pete Waterman has also stated he believes it is King singing on the recording. King can be clearly heard among the backing singers on the Little Eva recording. "Quand le film est triste"
In 1962, the French singer Sylvie Vartan recorded a cover of "The Loco-Motion" in French, called "Le Loco-motion". Vartan's version went to number 1 in France on October 13, 1962 and remained there for one week. B2. "Aussi loin que j'irai"
American rock band Grand Funk Railroad recorded a cover version of the song in 1974, produced by Todd Rundgren. The decision to play the song came about after guitarist Mark Farner was heard whistling the song in the studio. The Grand Funk version of the song featured guitars, several layers of harmony, and heavy drums. Some radio stations replaced the guitar instrumental section with the repeat of the bridge instead ("You got to sway your hips now"), because the disc jockeys strongly believed the static guitar solo was too experimental hard rock for airplay on commercial radio stations. During the 2000s, this version of the song was featured in advertisements for the Japanese technology and communications company SoftBank, featuring the pop group SMAP. SMAP also used the song on their television variety show SMAP×SMAP for a music video, singing along to the original Grand Funk recording rather than covering it. The song is available as downloadable content for Rock Band 3. "The Loco-Motion" appeared on Grand Funk Railroad's album Shinin' On and was released as a single in late winter 1974, eventually peaking at No. 1 on the U.S. 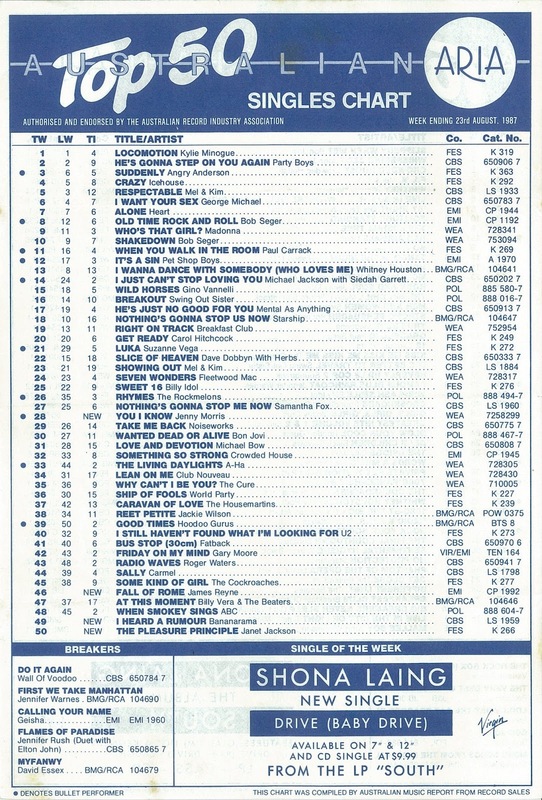 Billboard Hot 100 chart for two weeks in May 1974. It also reached number 5 in Australia, peaked at number 1 in Canada, and reached number 11 in Germany. Carole King also recorded a version of "The Loco-Motion" for her 1980 studio album Pearls: Songs of Goffin and King. The album peaked at No. 44 and spawned King's last top 40 hit to-date, "One Fine Day", which would reach No. 12 on the charts. King also sings the "Loco-Motion" on her live album The Living Room Tour, released July 12, 2005. The album peaked at No. 17 on the US album chart on July 30, 2005. In May 1986, Dave Stewart and Barbara Gaskin released a cover version of the song as a single. The duo had scored a UK No. 1 hit back in 1981 with their cover of "It's My Party" but had achieved little success since. For this 1986 single, they embarked on a big promotional push in an attempt to gain a second significant hit. The single, however, stalled at No. 70 in the UK charts in June. (1988) "Je ne sais pas pourquoi"
Australian pop singer Kylie Minogue released a cover version of the song in July 1987, as her debut single under the title "Locomotion". After an impromptu performance of the song at an Australian rules football charity event with the cast of the Australian soap opera Neighbours, Minogue signed a record deal with Mushroom Records to release the song as a single. This first recorded version was released on July 13, 1987 in Australia, and was later released the same year in New Zealand, Italy, and Sweden. The success of the song in her home country resulted in Minogue's signing a record deal with PWL Records in London and to working with the successful team Stock Aitken & Waterman. On July 28, 1988, a re-recorded version produced by Stock Aitken & Waterman was released worldwide with the title "The Loco-Motion". This release, also a major success, reached the top five in Canada, the United Kingdom, and the United States. Minogue's version of the track, which appeared in the 1988 film Arthur 2: On the Rocks, starring Dudley Moore and Liza Minnelli, substitutes the Australian term railway for the American term railroad in the song's lyrics. The 1987 "Locomotion" release was a huge hit in Minogue's native Australia, reaching No. 1 on the Kent Music Report singles chart and remaining there for seven weeks. The 1988 release of the song in the United Kingdom debuted at No. 2 on the singles chart—the highest entry on the UK singles charts by a female artist—due to strong 7" single sales and radio airplay. It remained in the number two position for four weeks before falling to number three. With sales of 440,000 it was the 11th best selling single of the year. The song became Minogue's third top five rated single in the UK and remains one of her most successful single releases to date. Throughout Europe and Asia the song also performed well on the music charts, reaching number one in Belgium, Finland, Ireland, Israel, Japan, and South Africa. During late 1988, Minogue traveled to the United States to promote "The Loco-Motion", where she did many interviews and performances on American television. The song was used in the hit film Arthur 2: On the Rocks starring Dudley Moore and Liza Minnelli. "The Loco-Motion" debuted at No. 80 on the U.S. Billboard Hot 100 and later climbed to No. 3 for two weeks. The song was Minogue's second single to chart in the U.S., but her first to reach the top ten. To this day, the song remains as her highest charting single in the United States; however, her second overall and most recent song to reach the top ten was 2002's "Can't Get You Out of My Head", which reached No. 7 on the chart, and ended up outselling "The Loco-Motion". In Canada, the song also reached the top spot in the pop sales charts. In 2012, during her K25 anniversary, the song re-entered the Japanese Singles Chart at No. 83. The music video for "Locomotion" was filmed at Essendon Airport and the ABC studios in Melbourne, Australia. The video for "The Loco-Motion" was created out of footage from the Australian music video. Near the end of 1988, the song was nominated for Best International Single at the Canadian Music Industry Awards. These are the formats and track listings of major single releases of "The Loco-motion". Shelley Fabares recorded the song for her second album, The Things We Did Last Summer (1962). Madelein Chartrand covered a French version titled "Ca sonne ca sonne Tony" (1974). The fifth-season episode of The Cosby Show, "How Do You Get to Carnegie Hall" (1988), features Clair, Sondra and Vanessa Huxtable performing a version of this song. La Toya Jackson recorded and performed the song in 1992 as part of her Moulin Rouge show Formidable. It was the only song in the show sung in English; the rest of the show features numbers entirely in French. Jackson also performed the song as part of her live sets throughout the early to mid 1990s. In 1983, Mike Love of The Beach Boys covered the song on his and Dean Torrence's album Rock 'N' Roll City. The Kidsongs Kids in 1994 perform this song on their DVD Boppin' with the Biggles. Atomic Kitten recorded the song for the soundtrack of the film Thomas and the Magic Railroad (2000). Orange Range used the melody line of "The Loco-Motion" on their song "Locolotion" (2004), which became the number-one success on the Japanese singles chart. The commercially successful song engendered controversy because Goffin and King were not indicated on its songwriting credit; their names were later added as co-writers to avoid lawsuits when the song was featured on the band's musiQ album, released during the same year. ^ a b Sharp, Dee Dee. "Dee Dee Sharp Turns Down The Loco-Motion". Musk Mellon. Retrieved 14 April 2015. ^ "Remembering Little Eva". April 15, 2003. Retrieved January 4, 2015. ^ "Little Eva (1943 - 2003): The girl from Railroad Street". Retrieved 4 January 2015. ^ a b "Official Charts > Little Eva". The Official UK Charts Company. Retrieved August 24, 2017. ^ Kent, David (1993). Australian Chart Book 1970–1992 (Illustrated ed.). St Ives, N.S.W. : Australian Chart Book. p. 178. ISBN 0-646-11917-6. ^ a b "The Irish Charts – Search Results – Locomotion". Irish Singles Chart. Retrieved February 20, 2018. ^ "Sylvie Vartan – Le Loco-Motion / Aussi Loin Que J'irai / Oui C'est Lui / Comme L'été Dernier". Retrieved 2017-11-24. ^ "Ultratop.be – Sylvie Vartan – Le Loco-motion" (in French). Ultratop 50. Retrieved 2017-11-15. ^ Kent, David (1993). Australian Chart Book 1970–1992 (Illustrated ed.). St Ives, N.S.W. : Australian Chart Book. p. 128. ISBN 0-646-11917-6. 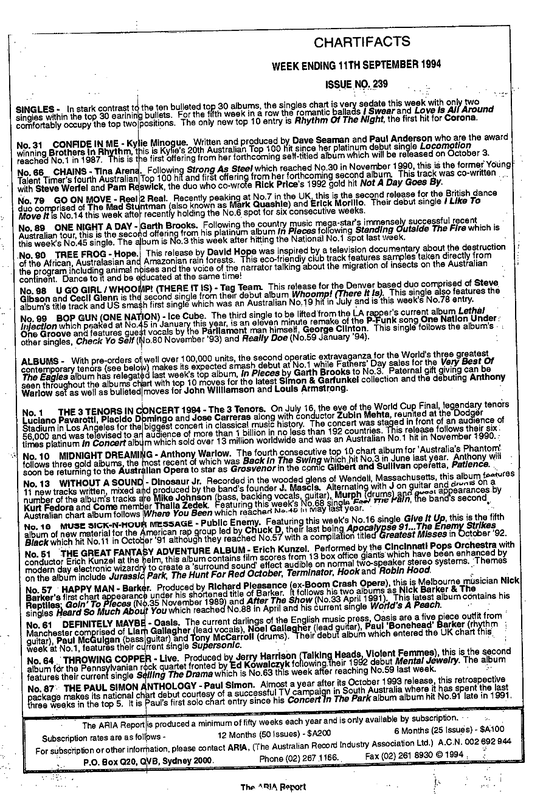 ^ a b "Australian Music Report No 677 – 13 July 1987 > Singles: New Releases". Imgur.com (original document published by Australian Music Report). Retrieved August 24, 2017. ^ Kent, David (1993). Australian Chart Book 1970–1992 (Illustrated ed.). St Ives, N.S.W. : Australian Chart Book. p. 202. ISBN 0-646-11917-6. N.B. The Kent Report chart was licensed by ARIA between mid-1983 and June 19, 1988. ^ "This Week In... 1988". Australian Recording Industry Association. July 18, 2017. Archived from the original on July 26, 2017. Retrieved July 18, 2017. ^ "Australian ARIA Top 50 Singles Chart". Australian Recording Industry Association. August 23, 1987. Retrieved August 24, 2017. ^ "Austriancharts.at – Kylie Minogue – The Loco-motion" (in German). Ö3 Austria Top 40. Retrieved February 20, 2018. ^ "Ultratop.be – Kylie Minogue – The Loco-motion" (in Dutch). Ultratop 50. Retrieved February 20, 2018. ^ "RPM 100 Singles" (PDF). RPM. Vol. 49 no. 5. 19 November 1988. p. 6. Retrieved 24 March 2019. ^ "Top RPM Dance/Urban: Issue 8704." RPM. Library and Archives Canada. Retrieved February 20, 2018. ^ "Dutchcharts.nl – Kylie Minogue – The Loco-motion" (in Dutch). Single Top 100. Retrieved February 20, 2018. ^ "Nederlandse Top 40 – week 40, 1988" (in Dutch). Dutch Top 40 Retrieved February 20, 2018. ^ "Eurochart Hot 100 Singles". Music & Media. 5 (35). August 27, 1988. pp. 16–17. OCLC 29800226. ^ "Kylie Minogue: The Loco-motion" (in Finnish). Musiikkituottajat – IFPI Finland. Retrieved February 20, 2018. ^ "Lescharts.com – Kylie Minogue – The Loco-motion" (in French). Les classement single. Retrieved February 20, 2018. ^ "Offiziellecharts.de – Kylie Minogue – The Loco-motion". GfK Entertainment Charts. Retrieved February 20, 2018. ^ "Kylie Minogue Chart History". RÚV. Archived from the original on January 31, 2018. Retrieved January 30, 2018. ^ "Charts.nz – Kylie Minogue – The Loco-motion". Top 40 Singles. Retrieved February 20, 2018. ^ "Norwegiancharts.com – Kylie Minogue – The Loco-motion". VG-lista. Retrieved February 20, 2018. ^ "SA Charts 1965 – 1989 (As presented on Springbok Radio/Radio Orion) > Acts M". Rock.co.za. Archived from the original on June 12, 2018. Retrieved August 24, 2017. ^ "Swisscharts.com – Kylie Minogue – The Loco-motion". Swiss Singles Chart. Retrieved February 20, 2018. ^ "Kylie Minogue Chart History (Dance Club Songs)". Billboard. Retrieved February 20, 2018. ^ "Cash Box Top 100". November 12, 1988. Archived from the original on 2014-10-22. Retrieved 2014-10-23. ^ "Kylie Minogue Chart History (Japan Hot 100)". Billboard. Retrieved February 20, 2018. ^ Kent, David (1993). Australian Chart Book 1970–1992 (Illustrated ed.). St Ives, N.S.W. : Australian Chart Book. p. 439. ISBN 0-646-11917-6. 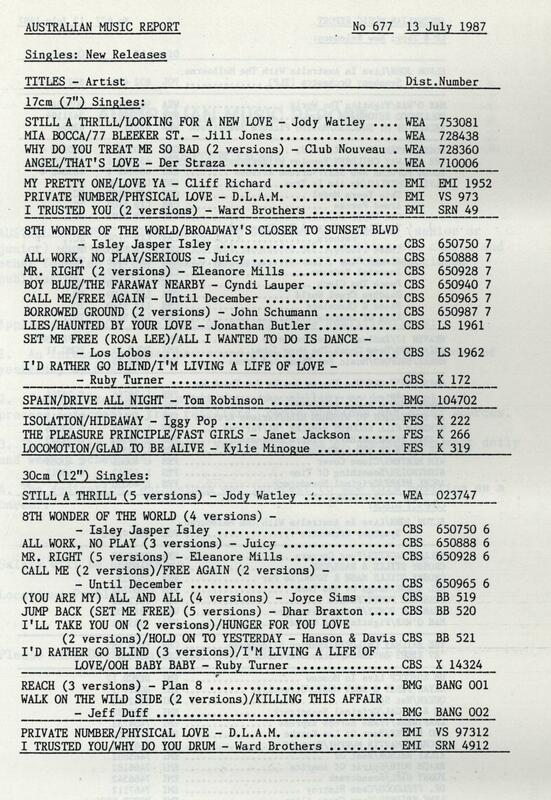 ^ "Top 100 Singles of '88" (PDF). RPM. Vol. 49 no. 10. 24 December 1988. p. 9. Retrieved 24 March 2019. ^ "Top 100 Single-Jahrescharts" (in German). Offiziellecharts.de. Archived from the original on June 12, 2018. Retrieved December 5, 2015. ^ "Top 100 Single-Jaaroverzichten" (in Dutch). Dutchcharts.nl. Archived from the original on June 17, 2018. Retrieved December 5, 2015. ^ "1988 The Year in Music & Video: Top Pop Singles". Billboard. 100 (52): Y-20. December 24, 1988. ^ "Top 20 Hit Singles of 1989". Retrieved 2 September 2018. ^ "Chartifacts: The ARIA Report" (239). Australian Recording Industry Association. September 11, 1994. Retrieved 2016-05-17. ^ Myers, Justin (May 25, 2018). "Kylie Minogue's Official Top 40 biggest selling songs". Official Charts Company. Archived from the original on April 6, 2017. Retrieved 2011-10-11. ^ "British single certifications – Kylie Minogue – The Loco-Motion". British Phonographic Industry. Retrieved 10 January 2015. Select singles in the Format field. Select Gold in the Certification field. Type The Loco-Motion in the "Search BPI Awards" field and then press Enter. ^ "American single certifications – Kylie Minogue – The Loco-Motion". Recording Industry Association of America. Retrieved January 10, 2015. If necessary, click Advanced, then click Format, then select Single, then click SEARCH. ^ "Rock 'N' Roll City". Discogs. ^ Thomas and the Magic Railroad Gullane Pictures, dir. Britt Allcroft, 2000. "Qu'est-ce qui fait pleurer les blondes?" "I'm Your Captain (Closer to Home)"
This page was last edited on 26 March 2019, at 01:38 (UTC).